Orange Dijon Grilled Chicken Recipe - chicken marinated in fresh orange juice, brown sugar, dijon mustard, garlic and apple cider vinegar - fantastic flavor combination! So versatile! Great on its own or in quesadillas, tacos, or on top of a salad. Labor Day is next weekend. I don't know about you, but we will be firing up the grill and overdosing on College Football! 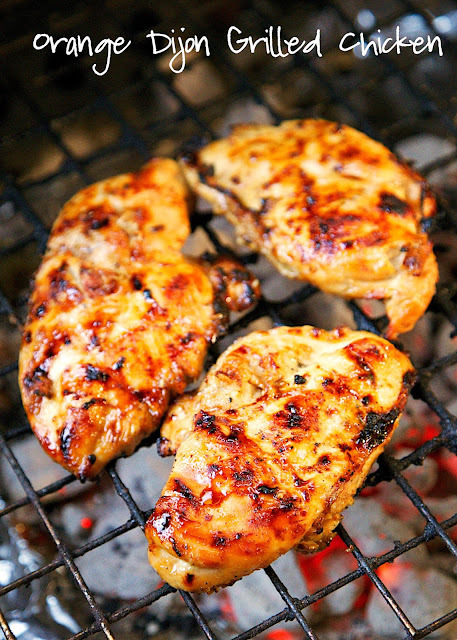 This Orange Dijon Grilled Chicken is perfect for our weekend grill-fest. The flavor combination is great! Fresh orange juice, brown sugar, dijon mustard, garlic and apple cider vinegar. This chicken is so versatile. It is great on its own or in quesadillas, tacos or even on top of a salad. We ate this on its own and in a quesadilla. Both were fantastic! This chicken will definitely be going in our regular dinner rotation. Whisk together olive oil, apple cider vinegar, orange juice, dijon mustard, garlic and salt. Pour over chicken and refrigerate several hours or overnight. 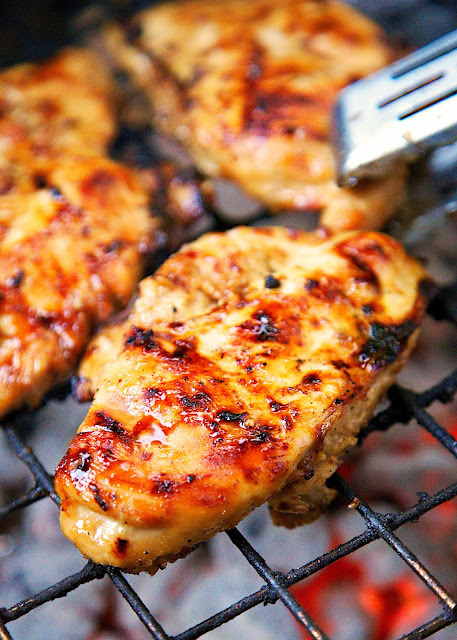 Remove chicken from marinade and grill for approximately 15 minutes. The chicken looks delicious and chicken prepared anyway is always a favorite in our house. I'm thinking these need to happen at my Labor Day Weekend festivities! I made these the other night and they were fantastic. So moist and juicy! Looks delicious definitely going to try this the next time I grill! My husband and I have been searching for renal friendly recipes. We made this with 1/4 teaspoon of salt and we replaced one of the tbls of mustard with a no salt added stone ground mustard (next time my husband will reduce the Dijon a little more and go up on the no salt ... just so he can eat more of it). We felt this was one of the best tasting, renal friendly recipes we have found to date. Thank you! What did you make as a side dish? Thanks for this recipe! Everything is “chilling” in the frig right now, so I’m waiting patiently to grill it tonight for supper. The corn is early here, but super sweet, so we are grilling corn, peppers, broccoli, mushrooms, zucchini, and onion with it and probably a pilaf to make my son happy, too. Summer has finally made an appearance, so this citrus infused recipe sounds refreshing after enjoying this much needed weather. Thanks again!